(Newser) – A glaring Photoshop fail has Australia—and much of the rest of the world—tittering after Prime Minister Scott Morrison was accidentally given two left feet in a photo on his official website. 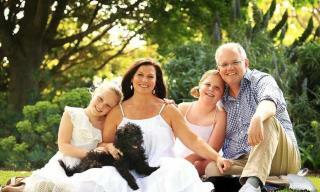 The family photo (which is still on the website, but has been restored to the original version) was altered to remove Morrison's somewhat beat-up athletic shoes and replace them with a gleaming white pair. The problem: In addition to the photo doctoring being pretty obvious, it was also done incorrectly ... and Morrison was given two left feet, reports the Guardian, which has a copy of the altered photo. #shoegate, as it's become known, quickly went viral, and jokes about it abound on social media. You can compare the original photo to the doctored one in this side by side comparison on Twitter. Even the politician pictures are lies. Trying to make himself look more well off and clean than he is. I don't see it with that arrow in the way. This guy Morrison is a fundamental Christian who carries the medieval middle eastern desert donkey rode tribal primitive nomadic ultra-illiterate hallucinating Ethiopian slaves founded god biz and Ethiopian storytelling Christian Bible carrying guy. So, it must be a his Christian god biz work, right!